Stars Mark Walhlerg and Denzel Washington are clearly having a blast playing off each other in between the flying lead and spurting blood that punctuates this cheerfully old-fashioned action caper. Wahlberg’s Stig and Washington’s Bobby Beans are small time criminals whose plan to rob a bank holding the ill-gotten gains of Mexican drug lord Papi (Edward James Olmos) goes awry when it turns out they’re both working undercover – Beans for the DEA, Stig for Naval Intelligence. A minor misunderstanding that results in Stig shooting Beans is largely forgiven when Stig’s commanding officer (James Marsden) tries to kill him and keep the stolen cash for his own purposes, and both realise that the money they stole doesn’t belong to Papi, but to a much more dangerous entity whose representative, played by a gleefully evil Bill Paxton, has no trouble slaughtering all and sundry in his quest to recover the loot. Icelandic director Baltasar Kormakur – he directed Walberg in the middling Contraband – wears his genre influences on his sleeve. 2 Guns takes place in the same mythical Tex-Mex borderland previously explored by the likes of Walter Hill and Sam Peckinpah; indeed an early scene where live chickens are used as target practice is a direct nod to the latter’s Pat Garrett And Billy The Kid. Beneath the snappy patter and macho posturing there’s a cynicism at the heart of the whole thing. Every institution is corrupt; every relationship, personal or professional, is suspect; and every character’s survival depends on their ability to measure the angles and calculate the odds. That subtext doesn’t overpower what is, on the surface, a fast moving, stylishly mounted buddy movie, though. Washington and Wahlberg have charisma to spare; Washington, in particular, effortlessly impressing as the confident and competent undercover operator. There’s noting too original going on here, but the fun comes not from being surprised by innovation, but seeing how well Kormakur and company embrace the tropes of the genre. It all ends in a flurry of bullets and explosions, as is only right. 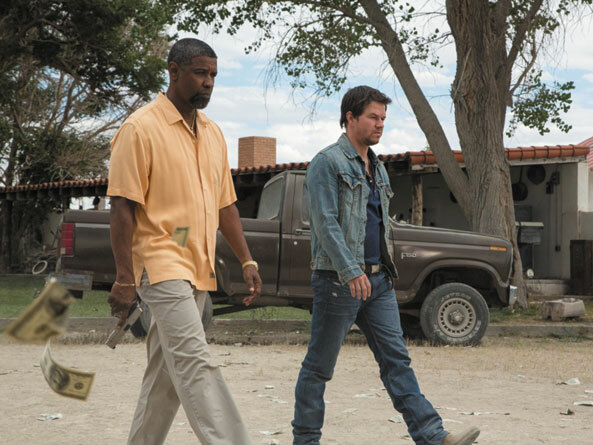 In a strange way, 2 Guns impresses because of its resolutely mid-brow ambitions – with the bulk of theatrical releases being either low budget indie fare or hyper-budgeted tentpole extravaganzas, there’s something admirable for a work that simply wants to entertain its audience without reinventing the rulebook or breaking the bank. Both of the film’s stars have shown a certain affinity with this kind of fare – Washington made a bunch of movies with action auteur Tony Scott before the director’s untimely death – and with a fairly obvious sequel hook left dangling at the end, there’s a chance we’ll be getting a continuation of 2 Guns down the track. If not, just enjoy it for what it is: a solid, dependable, unpretentious actioner.